There were some good strips in ROY OF THE ROVERS. 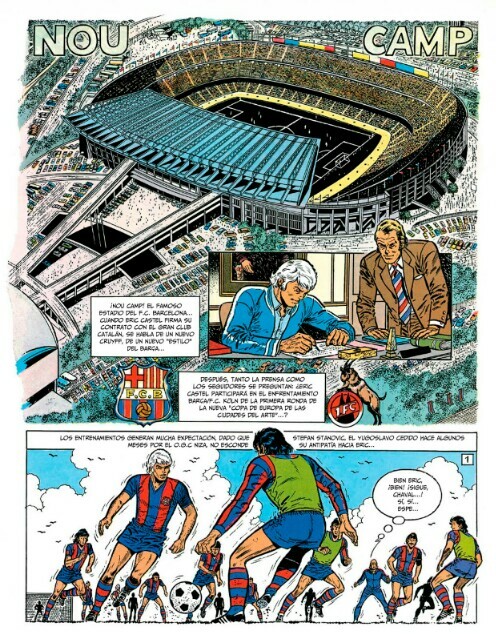 The main strip featured Roy Race, player-manager of the fictional Melchester Rovers (as the fictional teams played in real-life leagues, it presents an interesting question: did the leagues in their universe have an extra team or did the fictional team displace another team?). "Billy's Boots" was a good strip. Although it involved cheating. Billy Dane owned a pair of football boots which had belonged to a long-dead player called Deadshot Keen. Mystically, the boots allowed Billy to play in the style of Keen. Little cheater! Comics such as TIGER and LION also had strips. There were also features on real-life sports. And "Roy Race" often answered readers' letters. Boy sports in comics/strips were not common around me Robbie. I read "Peanuts" regularly and they used sports often. 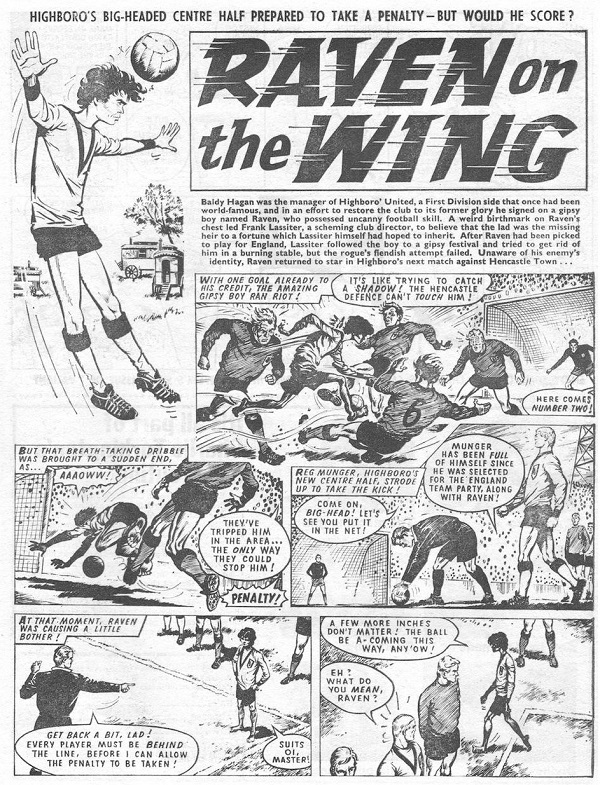 "Gil Thorpe" really was the only true sports related strip I read. I like the look of that NFL strip. I've read some strips over time. Not all of them have football stories. In fact, when I Googled for images, well most of the stories were about the player, Nick Jarvis, and his personal life (it's more of an ensemble cast now). Tiger, the original home of Roy of the Rovers, was predominantly sports-based but never really grabbed me so Mr Race's exploits passed me by. 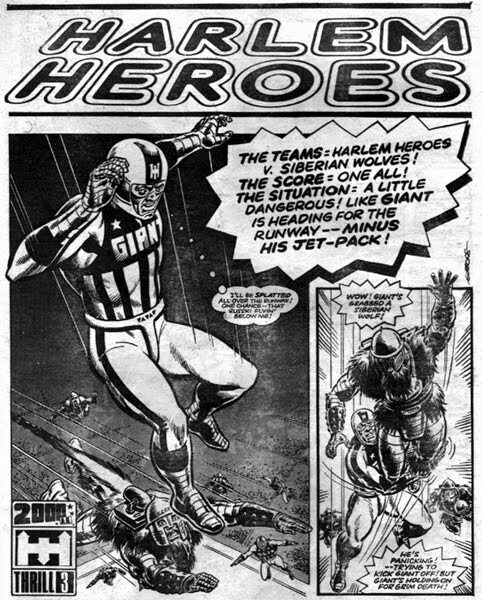 My boys' weekly of choice was Valiant which had a couple of notable strips. 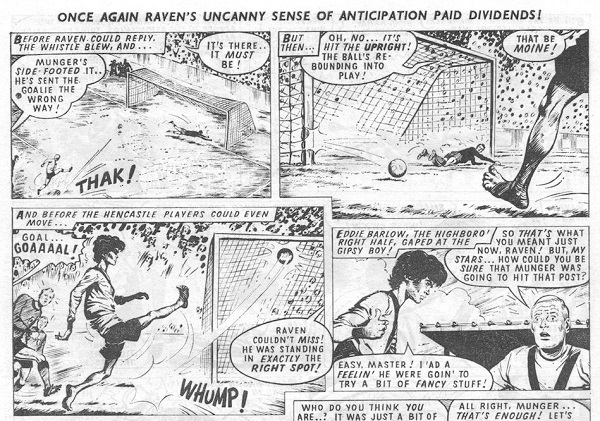 Raven on the Wing, with beautifully moody artwork by Francisco Solano Lopez, told of a gypsy boy who was recruited by struggling Highboro' United. Raven famously played in his bare feet although he once glued studs to them for a match played in heavy rain! For some reason it took a while for the title frame to reflect the fact that he didn't wear boots! 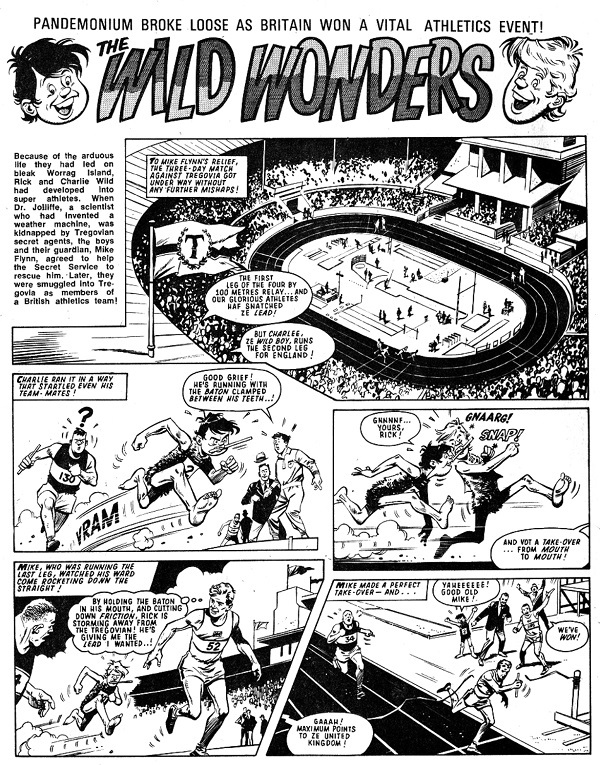 The Wild Wonders, drawn for its entire run by the great Mike Western, told of Rick and Charlie Wild who had been shipwrecked on bleak Worrag Island in the Outer Hebrides when they were infants. Their lifestyle turned them into super athletes and they were discovered by swimmer Mike Flynn while training there with the British Olympic team. Fascinating, those strips are new to me. The Wild Wonders began in March 1964 while Raven began in March 1968. 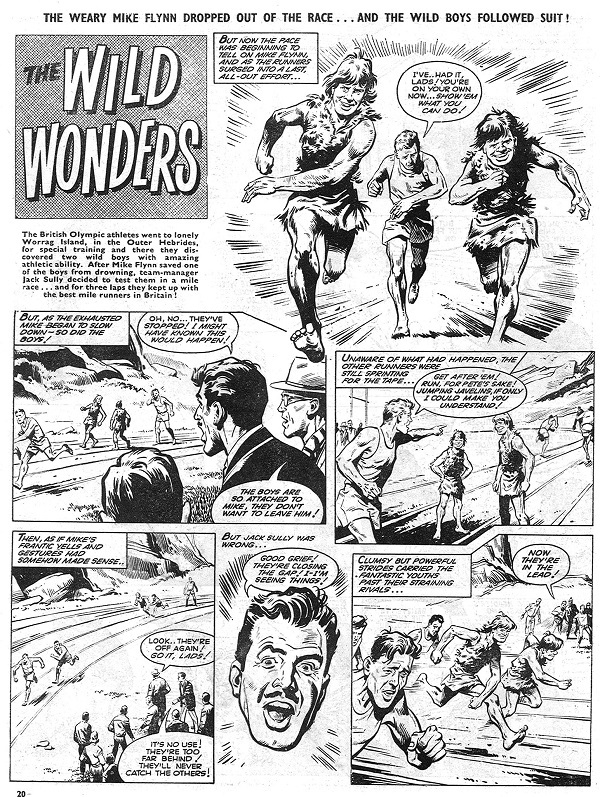 Both strips ended in May 1974 when Lion was merged into Valiant. I think they both returned for short runs before Valiant finally ceased publication. 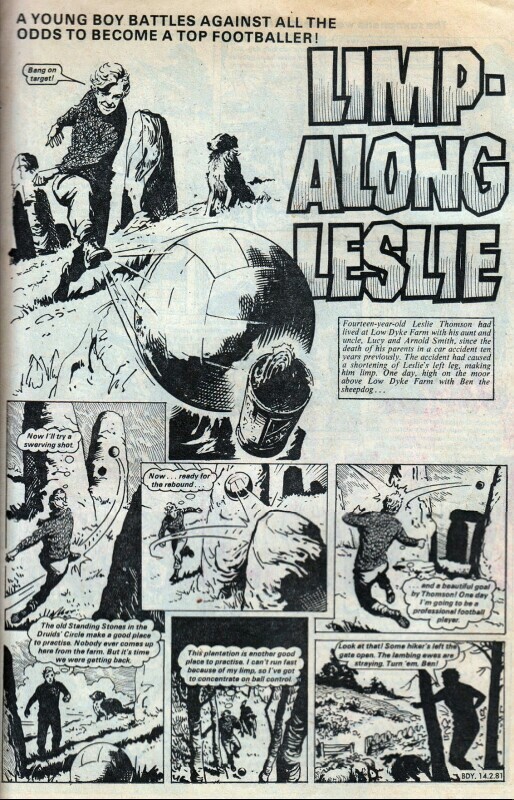 One strip that I don't think would be published today is Oddball Oates which began in the first combined issue of Lion and Eagle in 1969. Weedy scientist Albert Oates discovers a wonder-herb that turns him into a super-athlete when he inhales its fumes! Drawn by Tom Kerr who, like Mike Western, could switch styles depending on the subject matter. Thanks for these. Gotta confess, I was unfamiliar with all of those. Hadn’t realised Striker was going since the 80s. I do remember it in the 90s though. 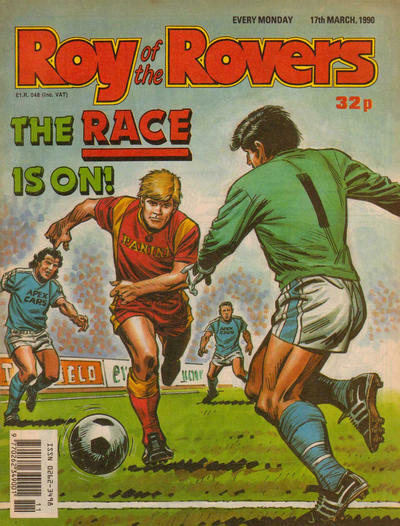 I was a Roy of the Rovers fan for a short while. I might give it a go. Thanks, Robbie. Although, it’ll be set in the present where football is characterless and purely focused on money. Btw. Good luck with Villa. I hope they get promoted. 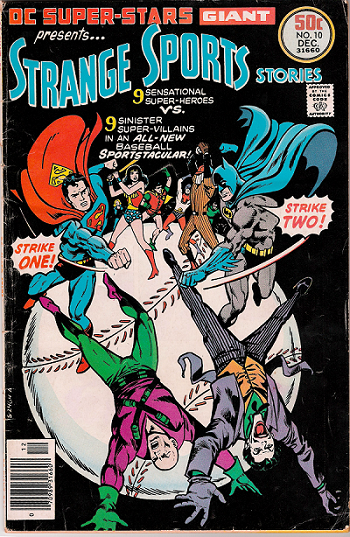 Seriously, though, sports comics have never really been a thing on this side of the pond. I did occasionally enjoy STRANGE SPORTS STORIES, tho the ones I saw were more close cousins to TWILIGHT ZONE, and did not feature superheroes. I actually pitched an idea for an ongoing Hockey drama comic to a group of comic artists and writers once, but not one had anything positive to say for it and some were very negative. Comic reading/collecting seems to be at odds with what they call jocks over here among guys. I don't get it. I just saw a way to get reading comics into the hands of regular kids, and sometimes that seems really at odds with important adult super-characters dominating the form. I never did join Friends Of Lulu or any of that, but I really did think having new original comics for younger and non-superheroes obsessives would give the medium a more solid foundation. With sports you have costumes in uniforms, and conflicts galore, plus off the field/ice relationships. When superpeople suddenly stop to go and change clothes it's sometimes a bit jarring to me how they do it without comment or signal, but sports teams always have a reason to wear the outfits. Japan is big on soccer/football comics and baseball comics for boys, but I've seen some good ones on gymnastics and horse competitions which appeals to many girls. America has really blown it at times, even letting the war and mystery comics die off when they were huge sellers at one time. This is just an opinion, Rebecca, and I'm applying it to all sports, but I wonder if it's possible that there are only so many ways for artists to draw a sports contest before it becomes repetitive. 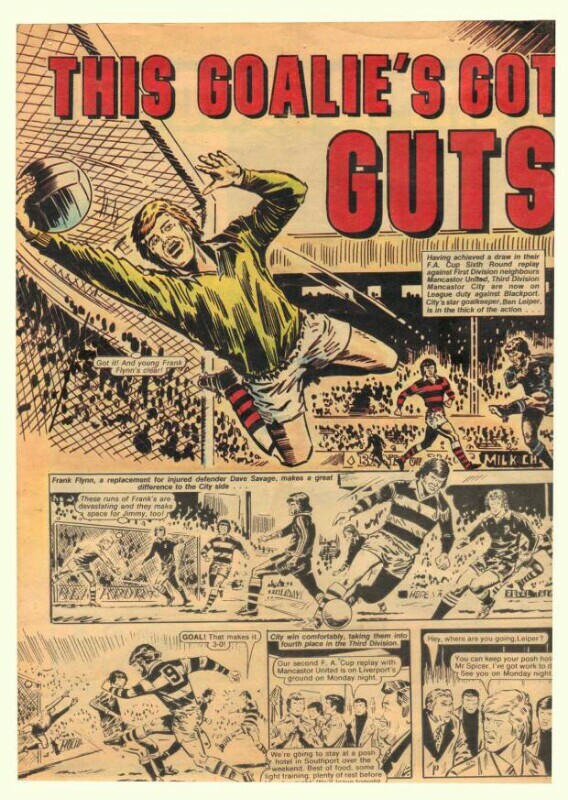 I mean, let's say there are 10 issues of a football (soccer) strip. After 5-6 issues, has even the best artist exhausted all the exciting poses/movement of someone scoring a goal? Just a thought. You could say that about superheroes, that they are a few variations of fight scenes over and over. 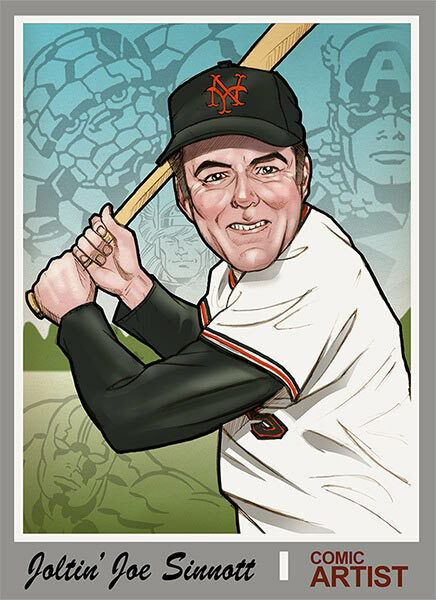 Straight sports stories can have as much variety as any dramatic story about a group of active characters, plus you have the visual elements inherent to team sports that comics are great at. I can see that they have gotten into a rut in places where they are a staple, but we've seen superhero comics have ruts, and vampires and zombies and soap operas. You can still have good guys, bad guys, conflicted guys, rivalries, heartbreak, and frustrations shown overcome and not. Also you could supe it up like Speed Racer, have spies and other types of backgrounds involved I guess. Also, it's not so much exciting poses as the meanings behind them... maybe this goal is needed really badly and the player knows someone on the other team got away with cheating, put our hero in the penalty box unfairly, so we really want this goal to happen, and then it doesn't, etc. etc. the bad player triumphed this time! Or the goal keeper is using illegal pads he inflates once on the ice and deflates when anyone could check them out so the hero pulls off an otherwise bad move that will somehow expose this and one of his team mates gets in the way. Good points, by the way. Yes, there can be dramatic stories. A UK soccer strip called STRIKER saw one player lose his leg to a shark. I think the doctors reattached it in time, but his career was over. He then became a manager. And in one story, the chairman's wife was kidnapped by criminals who demanded the team lose 9-0 - or they'd kill his wife. Cool Robbie, you start good threads and ask good questions. And Battlin' Jack Murdock in Daredevil was also supposed to throw his fight. Oh yes, you're right. I'd forgotten about Jack Murdock. I used to enjoy The Fists of Danny Pyke in The Eagle. loved this one in 2000ad. shocker- then have to rebuild the team with rookies. It's great!